Ferromagnetic materials are characterized by the presence of microscopic domains of some 1012 to 1015 atoms within which the magnetic moments of the spinning electrons are all parallel. In an unmagnetized specimen, there is random orientation of the various domains. When a magnetic field is applied to the specimen, the domains turn into an orientation parallel to the field, or if parallel to the field, the domains increase in size. During the steep part of the magnetization curve, whole domains suddenly change in size or orientation, giving a discontinuous increase in magnetization. If the specimen being magnetized is within a coil connected to an amplifier and loudspeaker, the sudden changes give rise to a series of clicks or, when there is a rapid change, a hissing sound. This is called the Barkhausen effect; it is an important piece of evidence in support of a domain theory of magnetism. the stepped variation of the magnetization of ferromagnetic substances upon continuous variation of external conditions—for example, a magnetic field. The effect was first observed in 1919 by the German physicist H. Barkhausen. Upon the slow magnetization of a ferromagnetic sample inside a telephone that is connected to a measuring coil put on the sample, noise and isolated clicks are heard. They are caused by current pulses that are induced in the coil by the stepped variation of the magnetization I of the sample. The Barkhausen effect appears particularly clearly in high-permeability materials on steep regions of the magnetization curve, where the magnetic structure is altered by means of processes of displacement of domain boundaries. The causes of the Barkhausen effect are heterogeneities of various kinds in the ferromagnet (foreign insertions, dislocations, residual mechanical stresses, and so on) that hinder the rearrangement of the magnetic structure. When the boundary of a domain that is shifting because of an increase in the field H encounters an obstacle (for example, an insertion), it stops and remains immobile during further increase in field strength. For certain field-strength values, the boundary overcomes the obstacle and begins to move even when there is no increase in field strength. 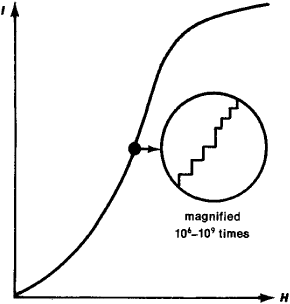 Because of such delays, the magnetization curve of the ferromagnet is stepped (see Figure 1). Figure 1. The magnetization curve of a ferromagnetic sample is stepped; each step corresponds to a change in the intensity of magnetization of a small volume of the sample (an individual domain or group of domains). I is the intensity of magnetization of the sample, and H is the magnetic field strength. The stepped variation of magnetization can be produced not only by a field but also by other external influences (for example, by the smooth variation of compressive stresses or temperature), under which a change in the domain structure of the sample takes place. The Barkhausen effect serves as one of the direct demonstrations of the domain structure of ferromagnets. The effect plays a large role in the elucidation of the processes of magnetization of ferromagnets, since it can be used to determine the volume of an individual domain. For the majority of ferromagnets this volume is approximately 10–6–10–9 cm3. Barkhausen, H. “Zwei mit Hilfe der neuen Verstärker entdeckte Erscheinungen.” Physische Zeitschrift, 1919, year 20, no. 17. The succession of abrupt changes in magnetization occurring when the magnetizing force acting on a piece of iron or other magnetic material is varied.